The Siren's Call is a free monthly ezine published by Siren's Call Publications. It is available from their website - www.sirenscallpublications.com. 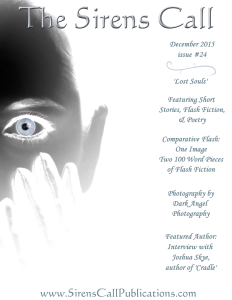 This latest issue is themed with the theme of Lost Souls. The wonderful short stories inside deal with the eternal questions of, what happens when we die? Where do we go? Is there life after death? There's some really great and imiginative tales from up and coming authors as well as those more firmly established. This issue features short stories from best selling authors such as Joshua Skye as well as fresh new talent on the rise. This issue also features an indepth interview with him as well as the prologue for Cradle his new fiction. This issue also features some great dark poetry from DJ Tyrer and Shawn D.Standfast as well as some dark micro fiction from Julianne Snow and Nina D'Arcangela. Rena is stuck in a stop too tantalising to leave. Like a mag pie she is drawn to all the weird and wonderful items she just can't let them go. But time is advancing fast and there's something she has to do before it is too late. Jonah has a very important decision to make. The outcome will last beyond death. Tommy Alexander is the new pastor at First Christian Church in Flatland, Texas. Recently graduated he longs for a packed congregation. His fiance is far away still studying at University and all he has for company are the strange whisperings he hears in his church. Ryan McSwain is the author of Monsters All the Way Down, you can read his excellent short stories for free by signing up to his mailing list. Two strangers meet trapped in a maze, desperate to get out. Neither man remembers how they got there but in these circumstances remembering is not going to help them. DJ Tyrer is the man behind Atlantean Publishing. His works have previously been published in Ill Considered Expectations, State of Horror :Illinois , Steampunk Cthulhu, History and Mystery, Oh My!, Tales of the Dark Arts, and Chilling Horror Stories. Little Balty is a troubled little boy, so is his mum who he had accompanied to court to sit and wait for their judgement. Joshua Skye is an award winning bestselling author He has written two novels; Cradle and The Angels of Autumn. His short stories Childhood Nightmares: Under the bed alongside previous Siren's Call publications. William wakes up in a small room he's desperate to get back to his family but has he paid the price of his actions? Amelia Gomez lives in Northern Utah with her husband and children. She inherited her love of reading from her mother and love of writing from her father. Sometimes you can find creatures in the dark that make ghosts seem harmless. Nicholas Paschall has published in dozens of anthologies both online and in print. His most recent publications include Creepy Campfire Quarterly, Demonic Visions and Shrieks and Shivers. A mother's devotion never ends, not even with death so don't test it! T.M. Delaney has previously been published in Shadow Story a Young adult horror anthology with her short story, Love Everlasting. She's also had three poems published in Journey. Have you ever wanted to know what it's really like when we die? You probbably shouldn't read this. Shannyn Campbell is an Austrailian author who holds a Creative Arts degree from the University of Wollongong. Lee.A.Forman has been previously published in many horror magazines and is currently writing a web series called Silence in the Willow field. Where do Atheists go when they die? Do the rules of Heaven and Hell still apply? Jon Olson is a author of horror and dark fiction. He is also a member of Pen of the Damned and The Horror Writers Association. Melanie and Jivin are a couple absolutely determined to stay together but each party has their own idea of together forever. Some people are just so stubborn that they refuse to die but what eventually will become of them? Paul Edward Fitzgerals beleives the best stories are those that come from a place in truth and loves writing macabre tales that focus on the dark side of human nature. Simon Gonzalez is exploring in Elm Park Woods, where he meets a friend Perry who's disappeared under mysterious circumstances. Pivka Jacobs has been writingfor many years and has previously appeared in The Magazine of Fantasy and Science Fiction, the Far Frontiers anthologies, The Literary Hatchet, Siren's Call Ezine, Riding Light Review amongst many others. Our protagonist is struck by writers block and will go to desperate lengths to overcome it. Joe Young is a freelance writer and illustrator he has previously appeared in Morpheus Tales, Wordland 2, Nat.Brut, Haunted Waters Press and many others. Luna mourns the ony man she has ever loved and would do anything to be reunited. Timothy C.Hobbs has previously published four novels, two novellas and two short story collections. He has appeared in many journals and magazines. Drew Glover isn't afraid of death. He's terrfied of the Grim Reaper and he should be, they have beef. John O'Brien lead a hard life but in death he's counting on a sweet afterlife. Rico did a very bad thing and even in death he doesn't feel remorseful. But luckily for him he has his sweet grandma to keep him on the straight and narrow. Winnona Vincent lives in California where she writes both Horror and Fantasy fiction.